Diggin’ your Dog is a 100% USA grassroots company owned & operated by people who truly DIG YOUR DOG! Rigorously sourcing all ingredients from USA farmers & ranchers, offering products that you will feel safe & confident feeding to your loved pet. It is their promise to keep their products real, and keep your pet happy & healthy! • FIRM UP! 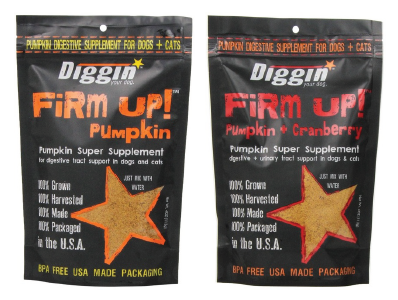 Pumpkin: Super Supplement for dogs and cats, very effective against constipation & diarrhea + immune boosting. Available in 1 oz., 4 oz. & 1 lb. re-seal-able packages. • FIRM UP! +Cranberry: The benefits of pumpkin + urinary tract support! Available in 4 oz. package. • CHARKI-O’s: Warning: highly addictive!!! Trachea + Dipped in Beef Liver Malt. Available in 4-5″ & 8-9″ individually banded cuts and in a 6 oz. bag of smaller cuts. 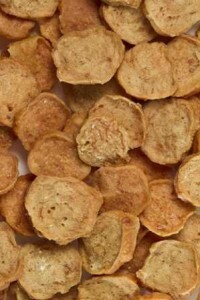 • CHARKI PUFFS: The best/healthiest treat your dog (and cat) have ever tasted! Beef Lung + dipped in Beef Liver Malt. Available in a 6 oz. bag. • STRIPPIN CHICKS: DYD’s version of the ever popular Chicken Strip- 100% U.S. / USDA Chicken Breast + Vitamin E. Available in an 8 oz. bag. • CLUCKS N’ GOBBLES: Charki Treat Chips! 100% Natural USA / USDA Chicken & Turkey. Available in a 6 oz. bag. • CLUCKS N’ MOOS: Charki Liver Sauce + Chicken + Beef swirled into each crunchy chip, making them very addictive… like the original Charki! Available in a 6 oz. bag. Ask for Diggin Your Dog products at your favorite Northland Retailer. Review: Awesome crunch treat the dogs love and I can carry around in my pocket without having grease stains they are very dry and crunchy the dog woof them down and look for more. 2 Benefits: Good for the teeth & no smell. 2 Benefits: No preservatives. No fillers. Con: I didn’t realize that the shelf life was quite as short. (although with no preservatives I should have known better.) It would be nice to incorporate the expiration date as a selling point! They’re SO fresh and natural you’ll want to use them up quick! Review: Nice treat. Dogs loved them!! One of my dogs is not food motivated at all. He seemed pretty excited about Charki’s Clucks & Gobbles! Love that it’s all sourced here in the USA too. Con: I personally did not care for the smell, however, I wasn’t the one eating them and the dogs loved them!!! Review: A good, healthy treat addition to our usual routine!! Review: Cats sort of liked but not a favorite. Ones with diarrhea had firm stools after eating a number of times…I would highly recommend for digestive issues and for good firm B.Ms…. Review: Great ”get in your kennel” treats or great for when the ”jackpot” is hit in training. When I pull these out I have a very captive audience! 2 Features: All meat and made in the U.S.
Con: Expensive, so I cut them into smaller pieces and my dog loves them all the same. Review: Charki Puffs are completely irresistible to my dog, and she will perform all sorts of tricks to get them. I appreciate that they don’t have preservatives, and that I can cut them into smaller pieces to make them last longer. They’re a very ’motivating treat’ for my dog! Review: Bruno absolutely loves Diggin your dog Clucks N’ Moos. They are so much healthier for him than the usual dog cookies since they are made in the USA and contain no fillers or preservatives. These are great for training new tricks and commands and also as rewards for giving eye drops or medicine. Review: My dog Mitzy loved the treats; they helped her have fun and walk better; it was a good supplement to the Barkin’ at the Moon food. 2 Benefits: Love the taste, want more! Con: Gone in 2 seconds! I was thinking that they would be a little like rawhide and provide a bit of chewing time, but not with my dogs. Review: These are great for walks. I put a few in my pocket and reward positive behavior with a ”chip”. The dogs LOVE them. 2 Benefits: Both my pups LOVE these like nothing else. I love that I can split the piece in half to share with other dogs. Review: Charki-Puffs are the latest hot commodity around our house…we have been implementing crate training with both of our dogs, and a Charki-puff for each of them in their crate has been prompting them to ”go to their place” so much quicker than with any other treat. We just had a one year birthday party for our oldest dog, and gave Charki-puffs away as a party favor for our guest dogs. Every dog loved them! Review: Now these were a HIT! The Chicken strips easily split into smaller pieces for training or for my smaller dogs. Keep your eye on the bag as they will steal it! 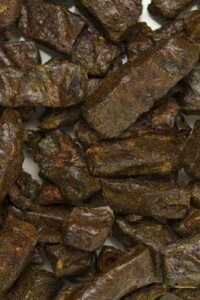 My dogs from 3# to 20# all absolutely loved these chews and I was happy knowing I was actually feeding them a SAFE product again. They love the chicken strips but after the scare with those other brands that came from China I stopped buying them. Now I can keep them satisfied with a Very Nutritional Treat that is SAFE. 100% Chicken! Con: Kills the grass wherever their urinate. Con: It’s hard to give your dog just one! I make sure to seal it well in another bag and put it away in the pantry when I’m done giving treats or he’ll keep begging or doing more tricks for more. Review: My dog loves these! I would recommend using them to reward especially good behavior or impressive tricks, since they are not your average treat! I have also used them to reward my dog after things he doesn’t like, such as getting hair brushed, so that he will have a better association with these activities. I love that these treats are all natural as well. Review: My pugs loved this treat, they inhaled it. They did not have any loose stools which can happen sometimes. I sat and watch them vigorously chew on them. They did not choke. They were completely digestible. They wanted more but unfortunately we ran out. Obviously they smell great because the pugs were at my side when I opened the bag. I was very thankful that they had a good smell and did not soil my carpeting. I give these chews a rating of over 100%. Con: A little big, but they easily cut into pieces. Review: My dogs are crazy for these treats. I have been using them for ’special’ occasions, however one of the dogs got into the cupboard and stole these treats! He passed up all the other treats there. I hope the three dogs shared them! very simple to give to the herd. they get very excited when they hear the treats rattle in the bag, more than usual. you can tell they really like the crunch, we also like because it takes them a little effort to eat the treat and they love it. Review: My dog loves these treats and so do all of her dog friends that have come to visit. They are larger in size so not really a training treat but great for stuffing in a kong with a biscuit on top. Con: Really stinky, so I just open and close the bag really fast. Because of the smell, it’s not a treat I would take with me for training outside the home. My older dog doesn’t like them, but he is a really picky eater. Review: This seems to be as natural as you can get for a snack: no fillers, only 4 ingredients, no preservatives, and even smells fresh. They are a nice size for a quick reward, and they are crunchy, which is better for your dog’s teeth than soft treats. Con: The cost of these treats is a little more than I do like to spend, but most of the pieces are easy to break, so I can stretch it out longer feeding smaller pieces. Review: I love that fact that these treats have no fillers, preservatives and are made in the USA. The dogs love them and come running when they hear me open the bag. Review: With four dogs treats are usually gobbled up before you can blink. Diggin Your Dog Charki-O’s are a treat that takes a little while to chew which satisfies the dogs longer. All the dogs go nuts when I bring the bag into view and their eyes light up with joy! So nice to have a treat that’s healthy, satisfies their desire to chew, and all my dogs can enjoy. 2 Features: Breakable chicken strips! Made in US! Review: These were by far the best chicken strips I have come across for my dogs and they loved them-I will for sure buy these for training, bribing and rewarding the Doberman gang in the future for sure! 2 Benefits: Natural Supplement for Joint Health and Dogs love it! Con: Big dogs could go through these very quickly. Review: Dog liked them is an understatement! The drool faucet has not been cranked open for any other treat ever. These are a healthy option, good for joint maintenance that helps motivate her to play new games and have a lot of fun! 2 Benefits: Naturally helps maintain healthy joints. Dogs love the flavor! Review: We gave these treats to our 2 dogs. One is 8 years old, and has suffered from Irritable Bowel Syndrome as well as a sensitive stomach for years. They both loved these treats! Our female with the sensitive tummy had no adverse reactions to this new treat. They didn’t stain the carpet. They couldn’t get enough of these treats. I feel good knowing that the ingredients, including the bag are made here in the US. I also like that they are natural with nothing artificial to preserve them. I feel good giving them to my dogs knowing that the contents will help them long-term maintain healthy joints. Con: It would be great if the pieces were smaller, but, I just tap them with a knife or hammer and voila! The Charki puffs easily break into a few smaller pieces. Review: My dogs love treats, and when they see the Charki Puffs bag, they go nuts, butts wiggling and tails wagging, waiting for their turn. I’ve never seen them eat treats so fast. My smaller dog typically ’buries’ her treats somewhere in the house, but she immediately eats the Charki Puffs. It’s great to finally find a treat she’ll eat immediately! Review: These treats are just what I was looking for a little change of pace. I like to use them as a finale after a session of training with the dogs. I use the Solid Gold lamb treats diced up real small when I’m clicker training for shaping behavior and then each dog gets one of these for a job well done when we’re finished with that session. I like knowing the treats have such a limited and recognizable ingredient list: chicken, turkey, salt. Nice! And, of course, it is obvious that the ’Made in the USA’ label is extremely important with treats like this. Review: I gave a 5” Charki-O Trachea treat to a friend’s dog I regularly care for who seldom accepts treats from me. When I was unwrapping the Charki-O, he was at my feet trying every trick he knew until I gave him the chew:) This was the most excited I have seen him react to any food/treat/chew–it was really fun for me to see him enjoy something so much! Review: My little dog is not a big chewer. Sometime she will chew on something for a little bit, but not all that long. She spent hours with this chew and goes back to it multiple times a day. It is fun to watch her having fun being a dog. Con: I would like a scoop in the bag. Review: I add a couple tsp. to most of my dogs meal – especially if she is eating raw frozen or freeze-dried foods that are very high in meat. The pumpkin and apple give her the added fiber and it eliminated the constipation she is prone to. Nice product, she loves it. I always add water and it make her meal look and smell good. Con: They are messy so neat freaks might not like the crumbs, but then again, the dogs will lick them up! Though I do recommend them for senior dogs, they might not be appropriate for every senior dog as they are hard treats and would require extensive chewing. Some older dogs with dental issues or lack of teeth may find these treats difficult to eat. Review: My dogs loved the taste of these Diggin Your Dog, Charki-O’s treats and I loved that they’re healthy and provide joint support. I love that they are 100% grown, raised and harvested in the USA and that they contain no fillers or preservatives. 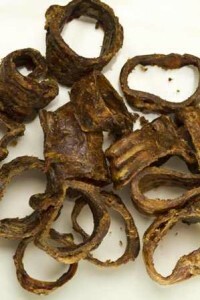 The treats contain two ingredients – beef trachea and beef liver. Simple, delicious (per my dogs) and healthy! One of the most common reasons I start seeing senior dogs for massages is to help ease pain associated with their joints. Arthritis, spondylosis and other degenerative diseases is painful and because of that, it starts to cause other issues, such as muscle atrophy and reduced range of motion. Typically, when a dog starts to have trouble getting in the car or unable to walk up and down stairs alone is when the pain and degeneration are noticeable and it triggers their person to ask for help. Now, while it’s true that we can’t stop time and that we all get older – humans and dogs alike, we can help our pets live the healthy and life by making healthy choices for them. 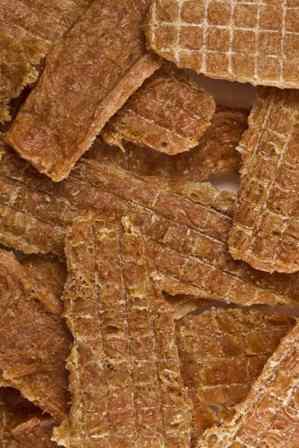 These dog treats, Charki-O’s, would be one simple way to do that! I will definitely recommend these treats. “Can I have some more please”? Review: An easy way to add healthy nutrients to your pets diet.